Full disclosure! We know - and love - Mardra and Marcus. Anne: When I schedule a meeting with Mardra I block out some extra time, because I know we are going to find more to talk about than what's on our agenda. Marcus and I are in a book club together. I get to see these two in action when I attend an author reading of Black Day: The Monster Rock Band. They are joyful and fun to be around, but Mardra isn't afraid to tell the hard truths. She is not apologetic about her choices and opinions. She is a well-educated and passionate advocate for Marcus and his peers. So I knew before I opened the book that there would be a lot of Mardra's heart in it. Trisha: Claire was only a few months old when I first met Mardra and Marcus. My husband and I listened to this power duo talk about advocacy and were so inspired. Seeing a young adult with Down syndrome being fully engaged and immersed in the "real world" gave both of us such hope about Claire's future. After speaking to Mardra, my passion for advocacy grew and I know it was due to her setting such a strong example. Anne: The very first thing I appreciated about The Parent's Guide to Down Syndrome is the advice to seek out a local Down syndrome association. As the director of the Down Syndrome Alliance of the Midlands, I have the privilege of watching my families welcome each other to the community and share stories and support. This book will provide that sense of community for any parent not quite ready to dive into a local organization or who unfortunately does not have one geographically accessible. 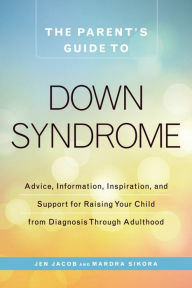 Anne: Trisha and I are proud to recommend this book to parents of children with Down syndrome. We think wherever a parent might be on the journey, a connection to information and other parents' stories is extraordinarily helpful and can be found in these pages. The book is available at Barnes & Noble (in stores and online) as well as Amazon. For special offers, click here. To read the complete review, click here.